Loved the cottage and village very handy for st mawes. but found the locals in portscatho stores and pub very unfriendly i have travelled to many parts of cornwall and devon and have never encountered this hostility before..
One Old School Cottages provided us with everything we needed for a week away. The house was clean, cosy and comfortable and was a real 'home from home'. We were greeted with milk, biscuits and wine upon arrival which were very welcome, together with contact details for the caretaker. The kitchen was very well equipped with pots, pans and other dishes, as well as lots of cutlery. How lovely too to have a plentiful supply of dishwasher tablets and clothes washing capsules, rather than a token one or two. 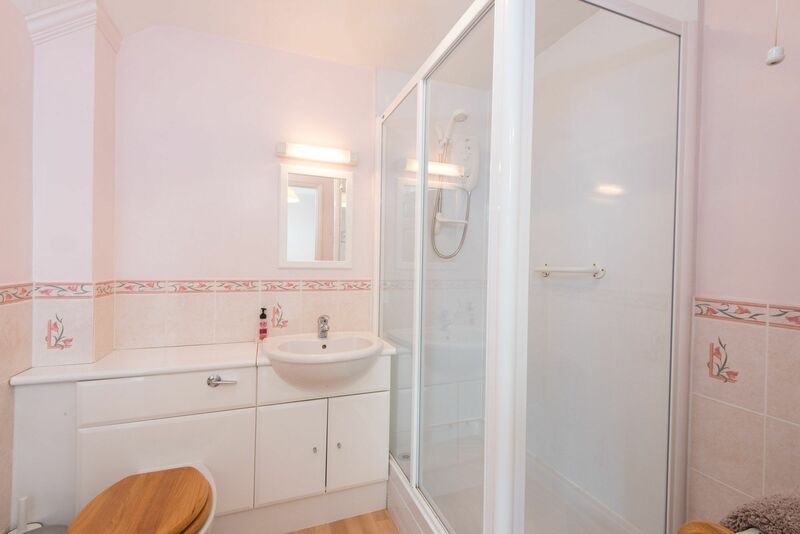 The bathrooms were clean and the bedrooms nicely presented. Although the weather was not conducive to sitting outside, our dog welcomed a safe space to wander in. We will certainly be back! 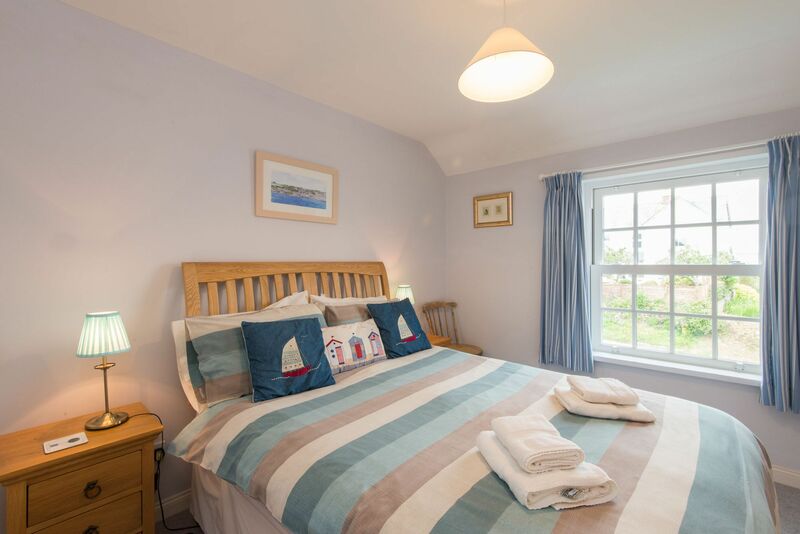 Lovely Cottage - Better than expectations - It was a home from home experience with cosy and comfortable furnishings - Close to Coastal paths ideal for walking with 2 Pubs very close and a few more within driving distance. 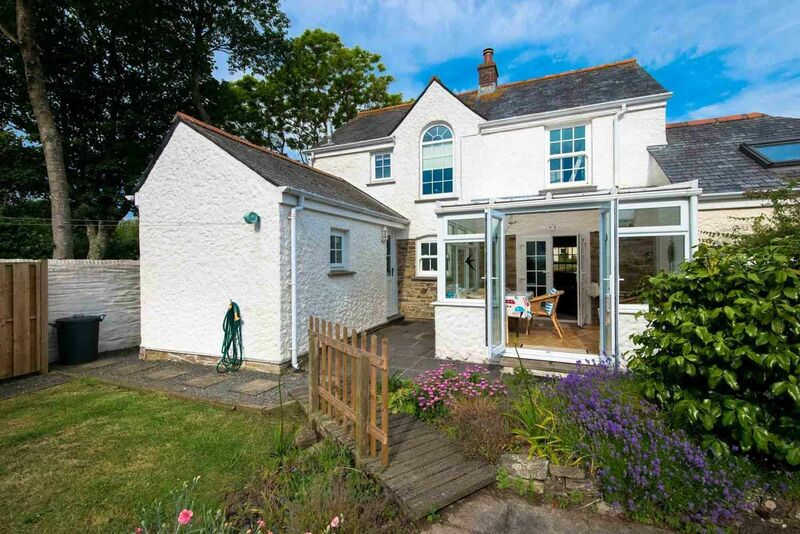 Lovely part of Cornwall - Unspoilt and quiet - Would recommend this Property. 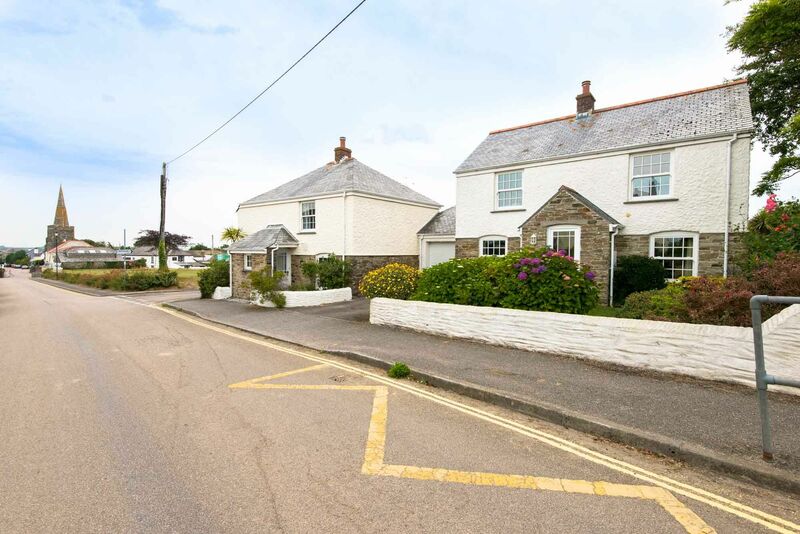 This was our 4th visit to One Old School Cottages in the last six years; the house is in an ideal location for the local beaches and Portscatho. We had a great week exploring the beaches and local sights. 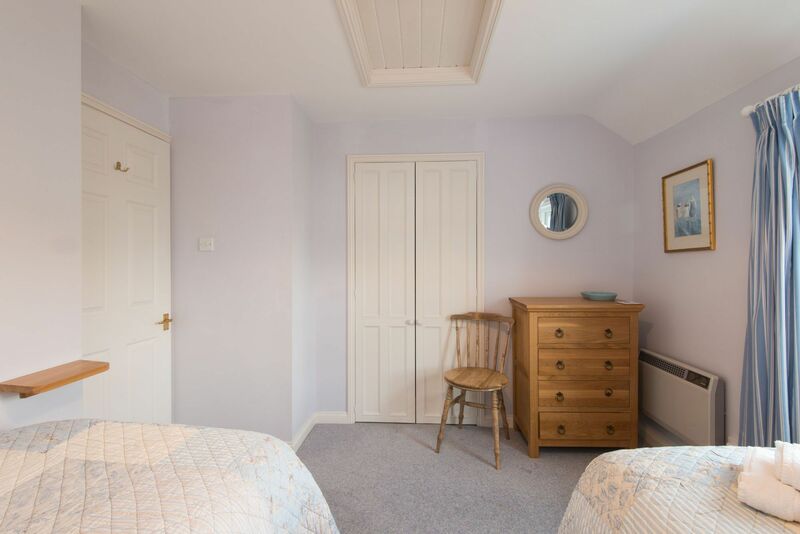 The cottage was lovely with loads of room for 6 adults and exceptionally well equipped. (Conservatory was a great extra space when we all needed some space!) It was very comfortable and well furnished. Nothing seemed to have been forgotten. The location was superb - a 10 minute walk to the sea in the lovely village of Portscatho (though the pull on the way back up may have been too much for some! ), but far enough out to be very quiet. 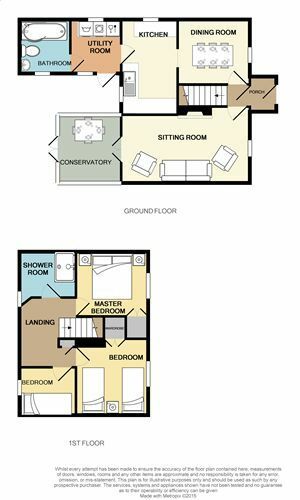 In summary a superb property that I would definitely recommend. One Old School house is a lovely cottage, extremely comfortable. We were 4 adults one small baby and the accommodation was very well suited to us. 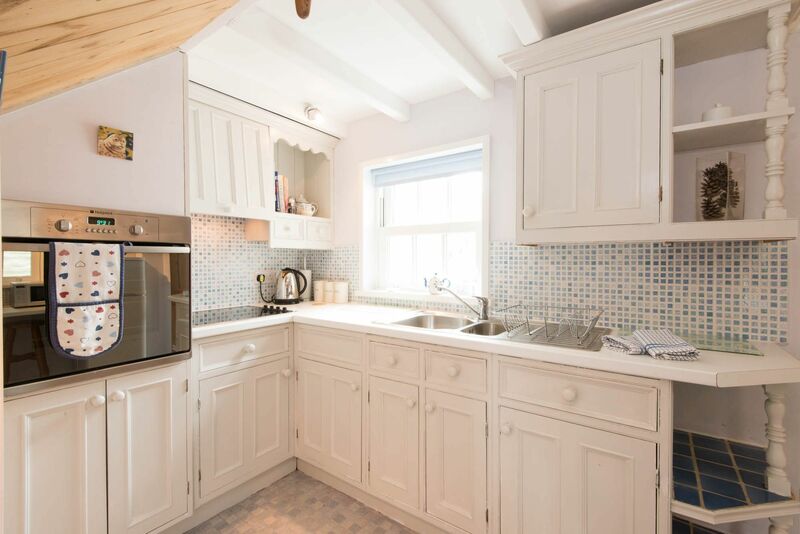 Beautifully clean, lovely garden, well equipped kitchen. Not every one wants to eat out every night and with a small baby we were able to cater for ourselves with no equipment problems. The caretakers were very friendly and helpful. 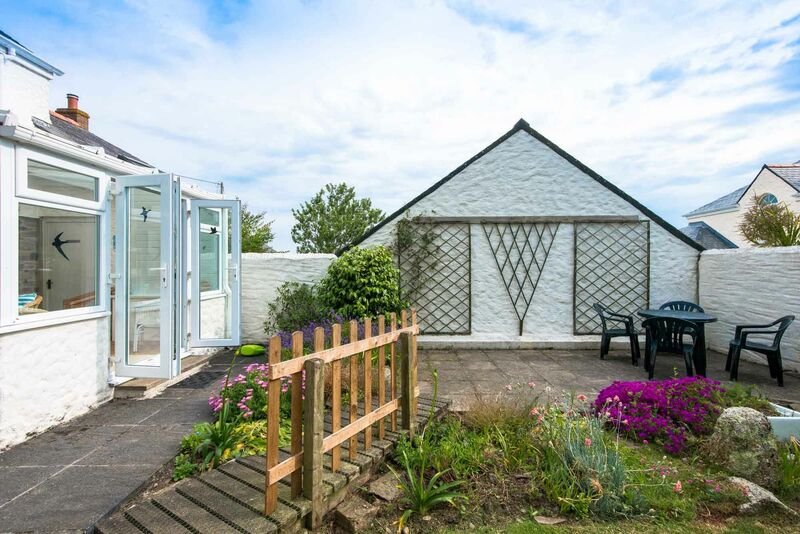 All in all we would recommend this cottage. We had a lovely relaxing week in the cottage. It was so comfortable I even enjoyed cooking the odd meal....We are so busy working that is a real treat to just relax together and enjoy nice food and each others company. The cottage is gorgeous and I could move in. The information you left for your visitors was extremely helpful and the ferry was handy. Cornwall is beautiful and we will happily come again it was a lovely holiday, Thank you for all the care and attention you have put into making our stay great. 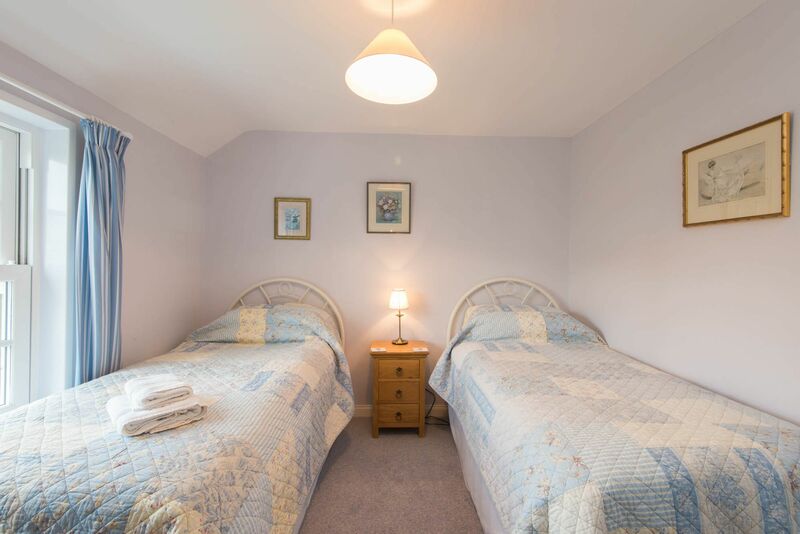 We were looking to book a late break in Cornwall and stumbled across this gem. 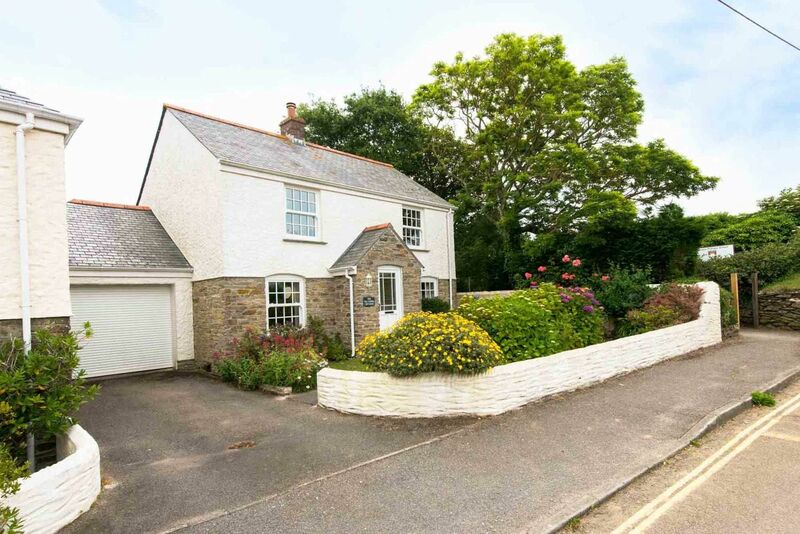 The location is excellent as a base camp for exploring the Roseland area. 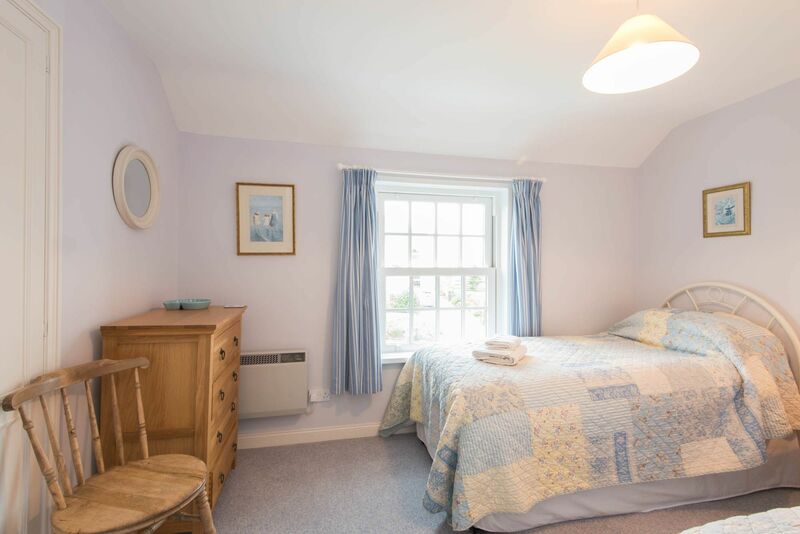 The cottage itself is comfortable and clean with the added bonus of off-street parking. To be honest, we were rattling around a bit as it was only me, my other half and our two Cavalier King Charlies. The two local pubs are friendly enough and serve good size meal portions, although I would recommend that you book in advance if you intend to dine at the Plume of Feathers in Portscatho. I would also recommend trying the takeaway Pizza's from Tatams Coffee shop, although this is a just a Thurs-Sat evening service only. The local beaches are superb and the majority are Dog friendly all year round. Our favourite was Towan Beach about a mile south from the cottage. We had to drag our woofers off the beach when we left. I would also recommend visiting the Hidden Hut which is just up the coast from Portscatho. On one of the days we took the King Harry Ferry to Trelissick Gardens. The woodland walks there are beautiful as you often break out onto the shoreline of picturesque creeks. The castle at St Mawes is also worth a visit as is St Mawes itself. 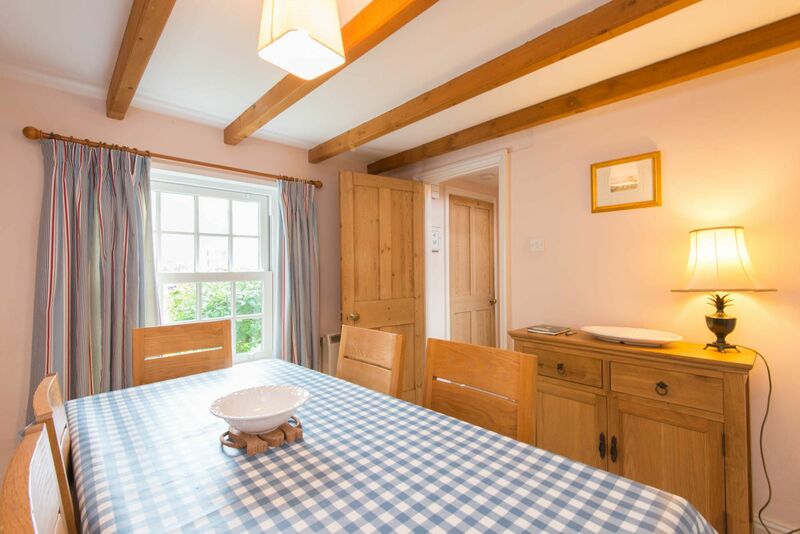 We had a wonderful week and would definately book this cottage again. In fact we have had family and friends already asking about the cottage after seeing our photos on FB. 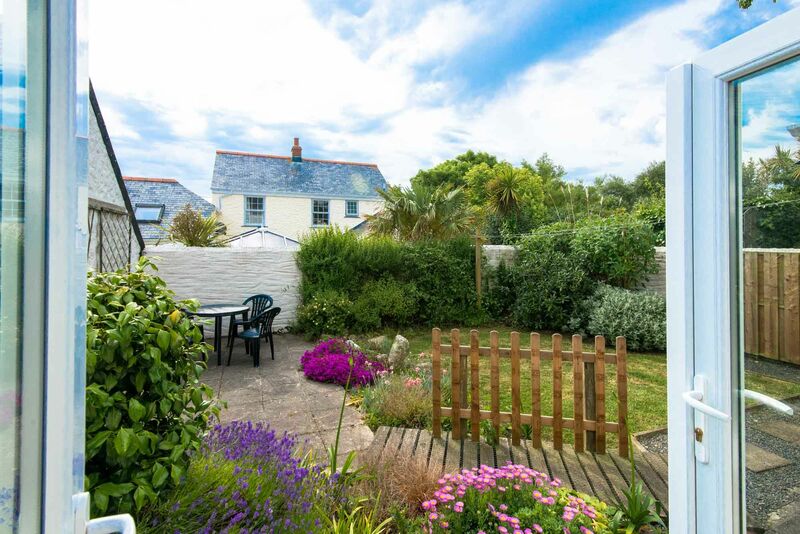 An excellent cottage in an excellent location with easy access to a multitude of great walks and beaches.Very quiet and peaceful, and the perfect situation for a late summer break when its quieter but with basically good weather. Would definitely recommend it to others. We had a super holiday staying in One Old School cottage. 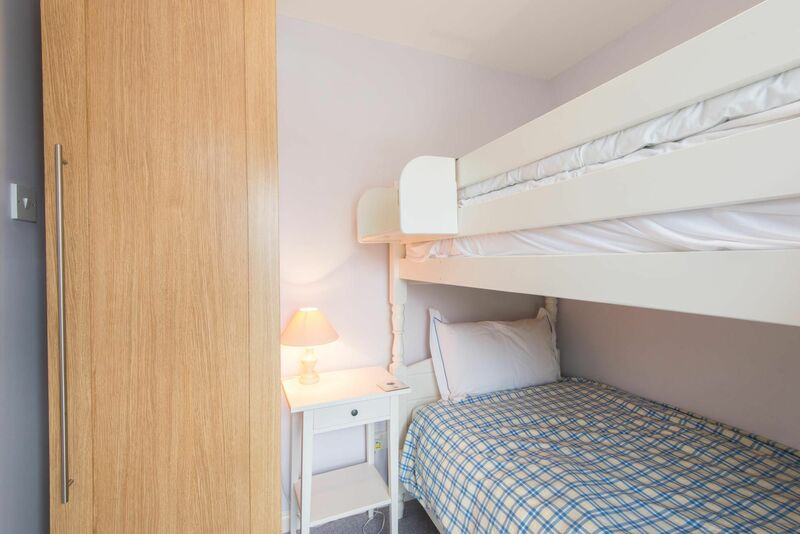 It was clean, bright and airy, well-equipped and with plenty of space for our family of two adults and three children under 10. The welcome gifts of wine and biscuits were very much appreciated and we used the maps, walking guides, jigsaws and books provided. 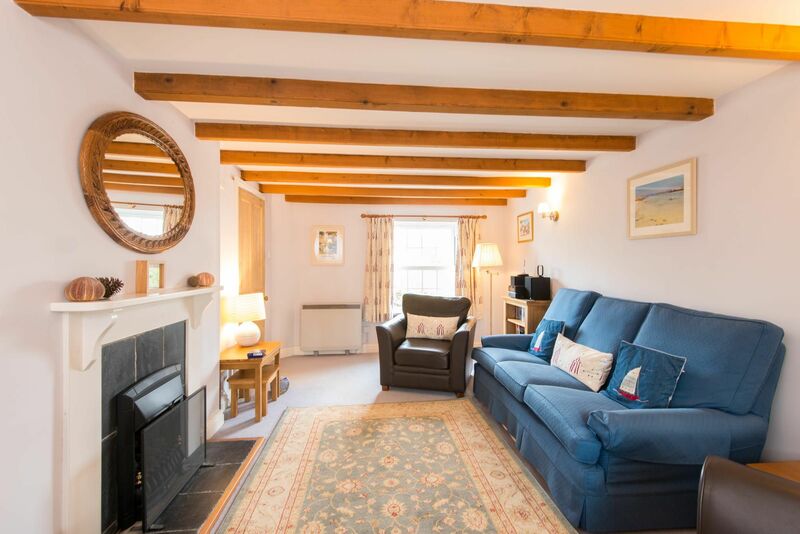 The location was also great; easy walking distance to pubs, restaurants and shops in Gerrans and Portscatho. The beach at Portscatho was a short walk away, with the lovely Porthcurnick beach (and fabulous Hidden Hut café) being just a little further. We also enjoyed walking from the cottage to Towan beach a couple of times; about a 2 mile walk along a relatively gentle stretch of coast path with glorious views. 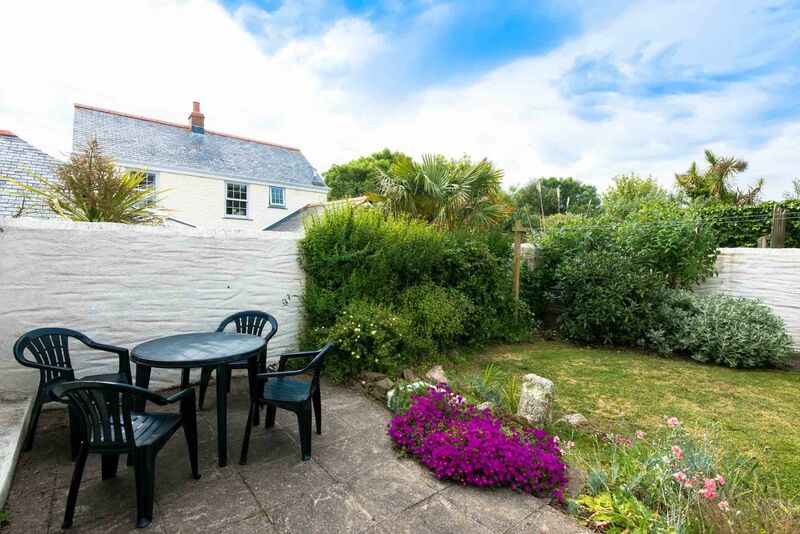 We love the Roseland peninsula as it is a relatively unspoilt part of Cornwall and would recommend this cottage as a great base for a holiday on the Roseland. 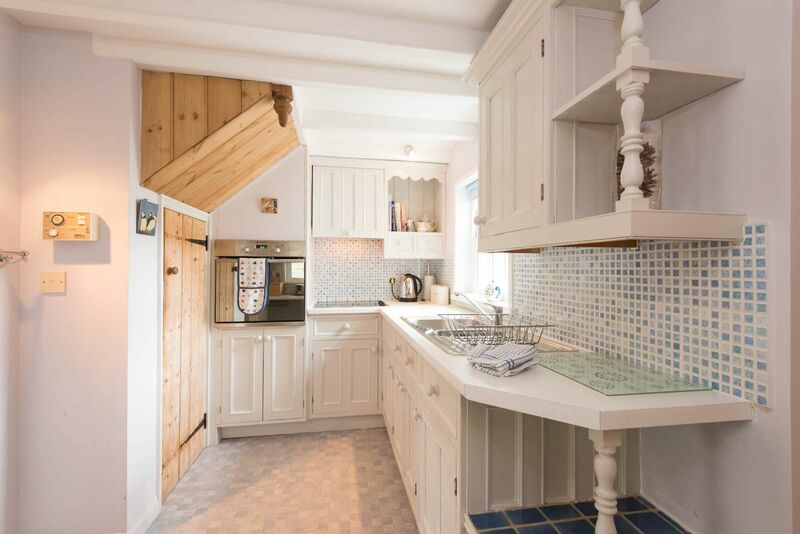 This is a lovely new build cottage with flourishes of old style charm. The location is good for a local pub (of which the landlord was a little abrupt), but the school next door is full of screeching kids at break times (not a problem if you're expecting this) and the local beach is 500-600m down a very steep path. The garden is quite small (as is the norm with new style houses these days). Ok, that's the main negatives. The good bits are as follows... 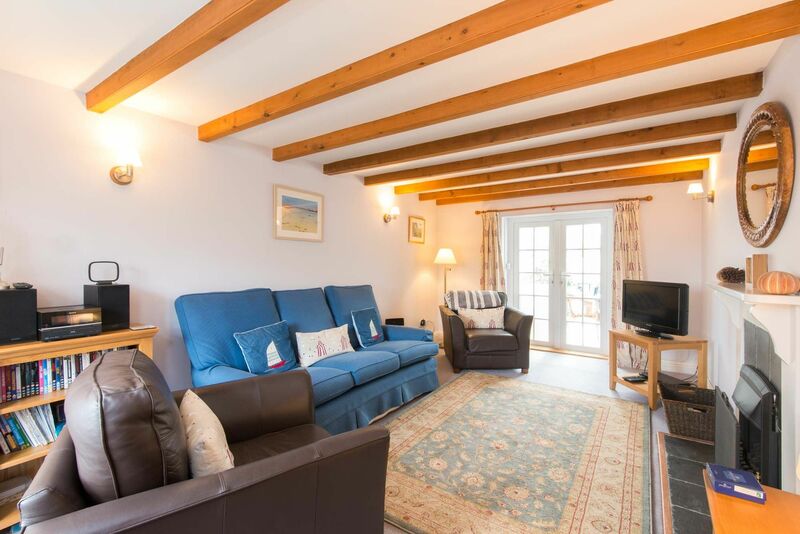 The cottage is in very good comdition and is very well equipped - the wifi is good as well which is important as mobile signals are poor in the local area. There is a free car park nearby if you have a second car with you just 50m away. The pub is 100m away and serves large protiins for Cornwall prices. The local shop/ (at the bottom of the hill) have just about everything you need - as is a second pub and also an excellent coffee bar with take-away stone baked pizzas. The village of Gerrans blurs into Portscatho and there are some lovely local beaches with a swimming platform out to sea. The villages are pretty much unspoilt with no major tourist developments - perfect! St Mawes is 10 minutes drive away with a foot ferry to Falmouth. The local coastal walks are lovely and unspoilt. Would I stay there again? Absolutely! We are very familiar with the area and enjoy returning every year as it is so beautiful . The cottage is brilliant it was clean comfortable and well appointed. The caretakers were on the spot and very friendly and helpful. Perfect cottage in a great location. we also loved Portscatho - very cosy and friendly village providing everything we wanted for a great weeks holiday. 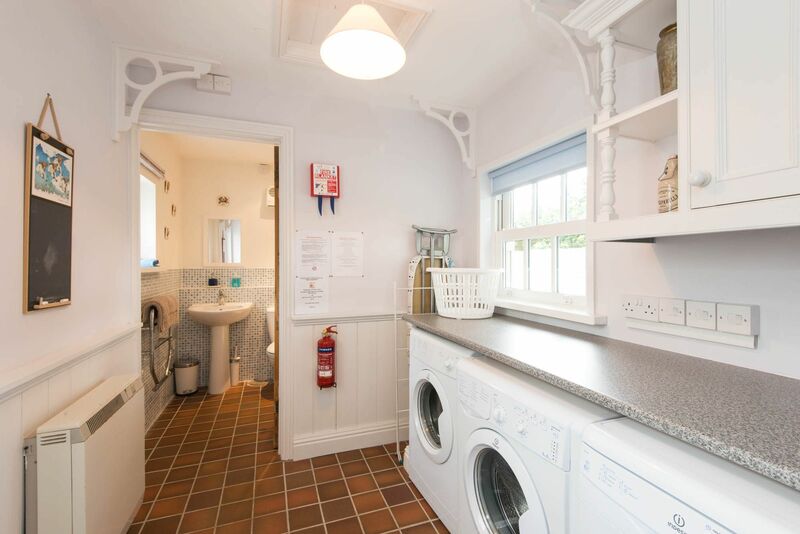 One Old School cottages is a modern three bedroomed house built on the site of the old village school that was burnt down in 1982. 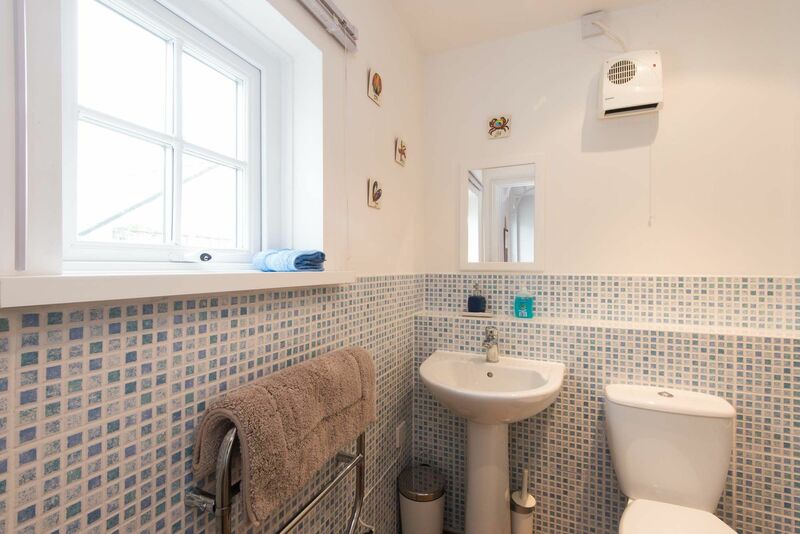 There are also two bathrooms, a lounge, a dining room, a utility room, a good sized kitchen and a conservatory, plus a small garden. As there were only two of us and a small dog we had plenty of room, but the house is really large enough for six people without the feeling that you are tripping over each other. The village of Gerrans is very nice as this is our second visit in under a year and the local pub, The Royal Standard, is very handy for drinks and meals AND you can take the dog in. On the whole an excellent holiday house in a lovely area. A thoroughly enjoyable birthday family weekend. The cottage was well equipped, comfortable, clean and lovely. 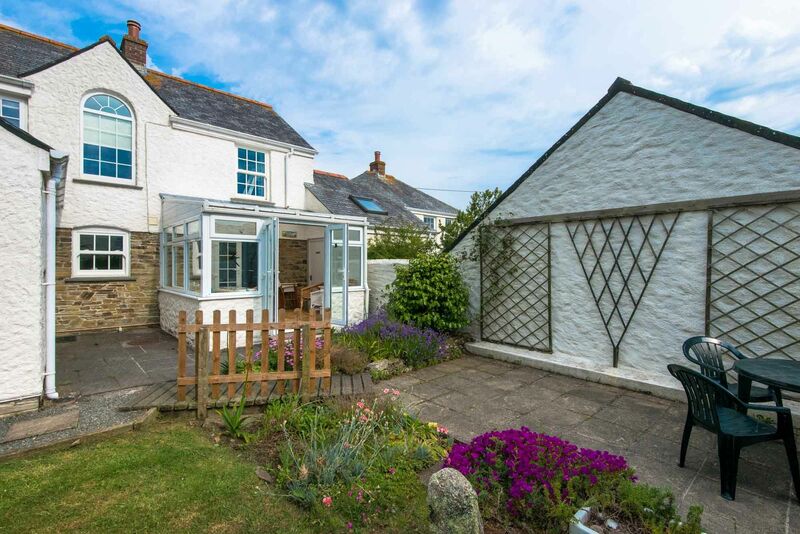 Great sea views and in a great location. Thank you. Reply from Douglas Thanks for letting us know about the gas fire, which has only recently been serviced. We will get it checked to make sure it is working properly. The property managers are just a few minutes walk away and can deal with such issues very promptly. Glad to hear you found the cottage comfortable and well kept. A lovely 2 weeks, just catching the “Indian Summer” for most of the time. 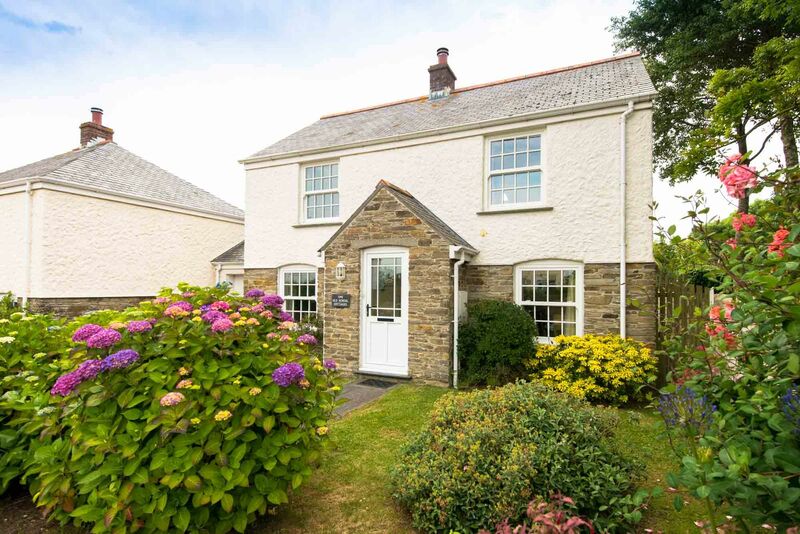 Ideal for walking and a cottage that is a pleasure to return to at the end of the day. Our fifth time staying at the cottage and still impressed by the way it has been maintained. What a lovely week! Wonderful beaches & places to visit. The cottage was a welcome place to return to after an enjoyable day out. We will return! A very enjoyable week in our favourite holiday destination. Plenty of good sunny weather and lots of fab walks. Most enjoyable trip to the Duchy of Cornwall Nursery at Lostwithiel. Good beer in the Standard. Where has this week gone? Really enjoyed our time here. Lovely countryside & beaches with plenty to do for the little ones. The cottage was so lovely and very homely. Home away from home! Can’t wait to come back again. What a wonderful week! We have had such a fantastic time playing on the beaches and exploring the local area. A really relaxing and much needed break for the whole family. The house is perfect and I am sure we will be back again soon. Lots of happy memories – thank you. A real “home from home” cottage. 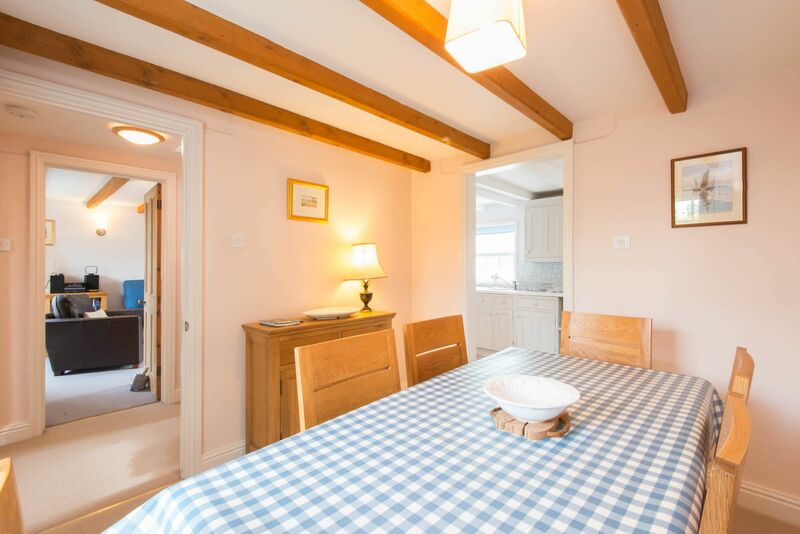 Clean on arrival, well equipped, comfortable cottage. Very happy and hope to be able to return again in the future. What a lovely holiday home. Weather has not been the best, however this has not spoilt a wonderful week away… We’ll be back. 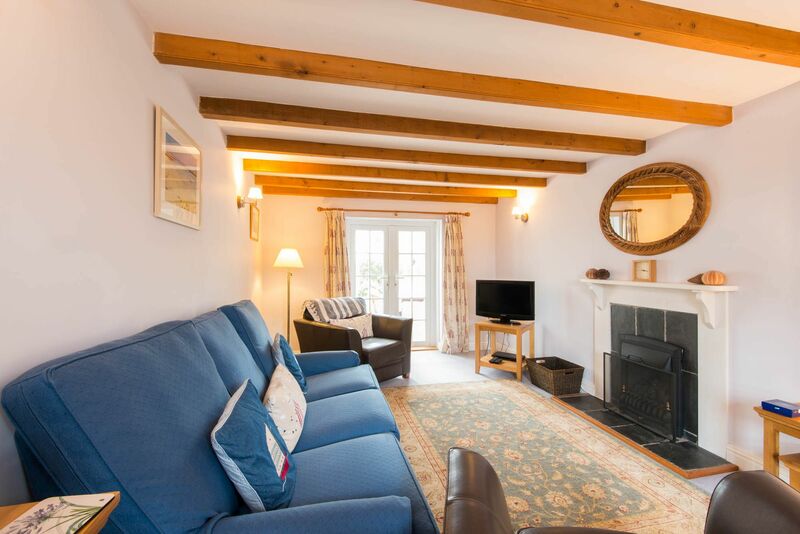 This lovely cottage, located at the southern end of the quiet village of Gerrans is a charming place to stay at any time of the year. 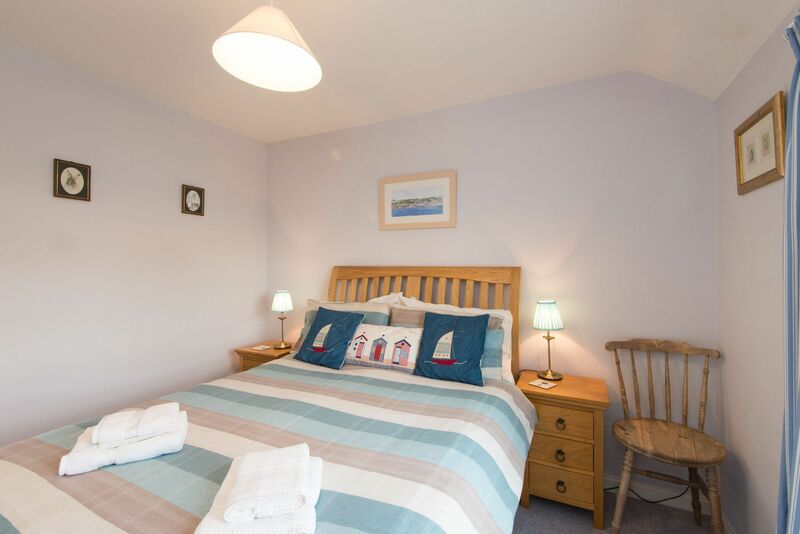 Within walking distance of two pubs, sandy beaches, a range of wonderful walks and the famous Hidden Hut beach cafe, it is a great spot for a holiday. The cottage, one of a small development of four, built very much in traditional style, but to modern standards. That means beamed ceilings, but not too low! It means a lovely open gas fire with double glazing to keep it really cosy. In addition there is a charming little garden to the rear which is a really quiet and peaceful place to enjoy. Ground Floor: A small porch gives access to the hall and lounge. The lounge has a fire place with gas fire. 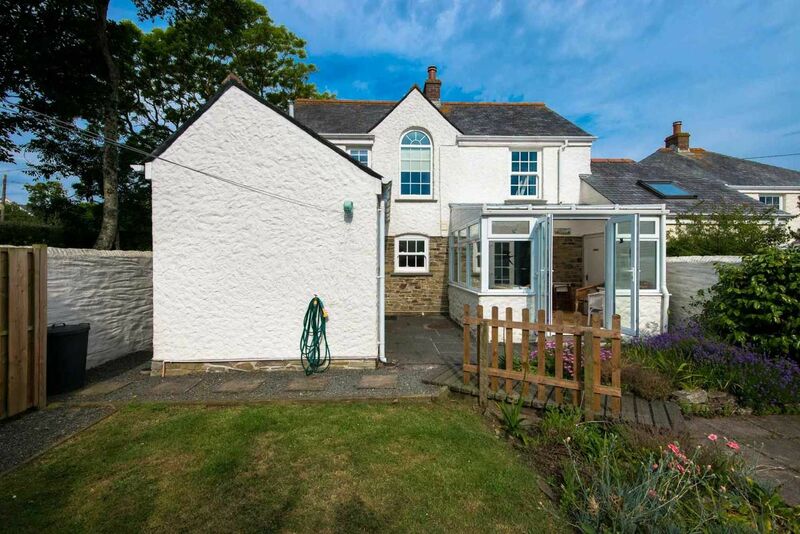 Doors lead to the conservatory and French doors to the enclosed rear garden. 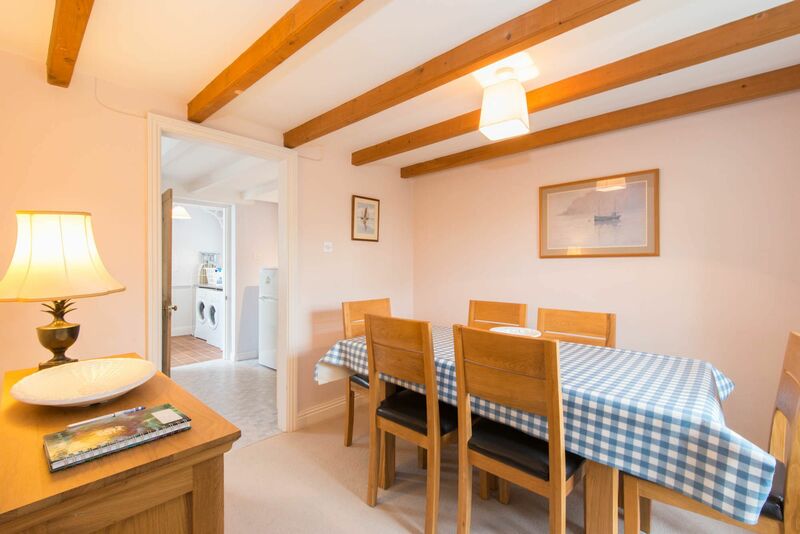 The dining room leads through to the good sized kitchen. 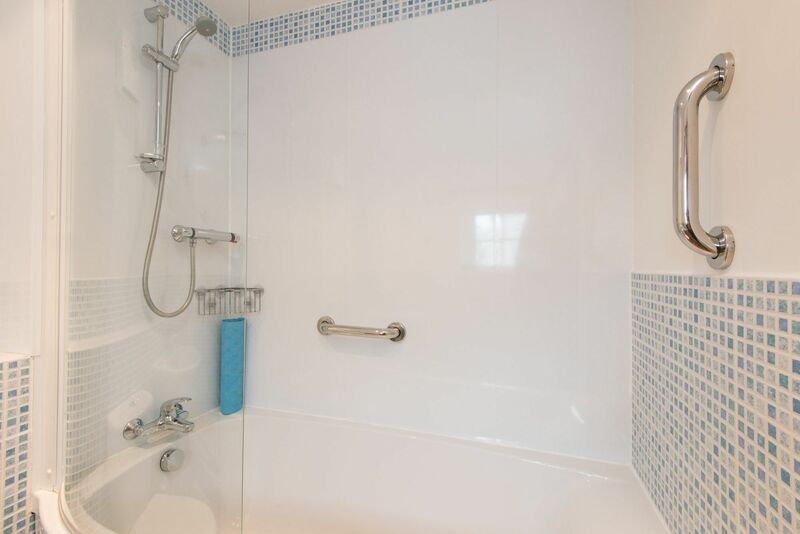 There is a separate utility room and a family bathroom with over bath shower. First Floor: Stairs lead to a landing with views over the rooftops out to the bay and glimpses of the sea. 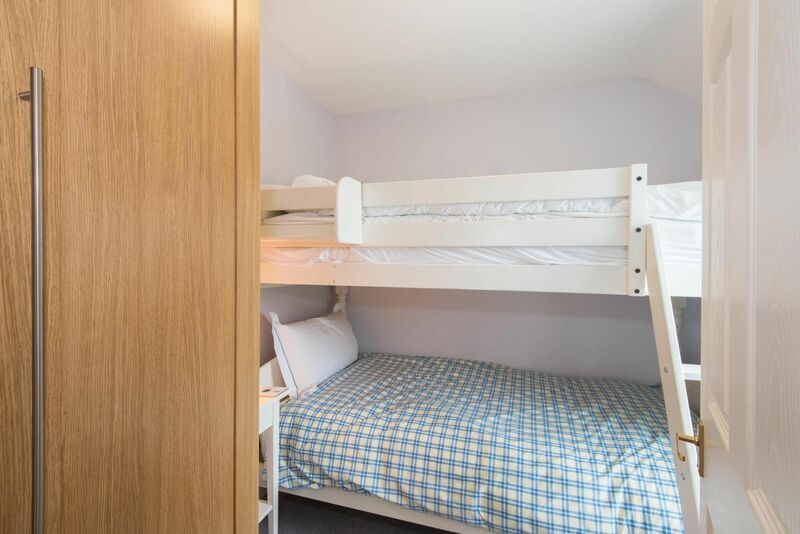 There is a double bedroom with 5' bed and TV, twin bedroom and bunk room with a separate family shower room. 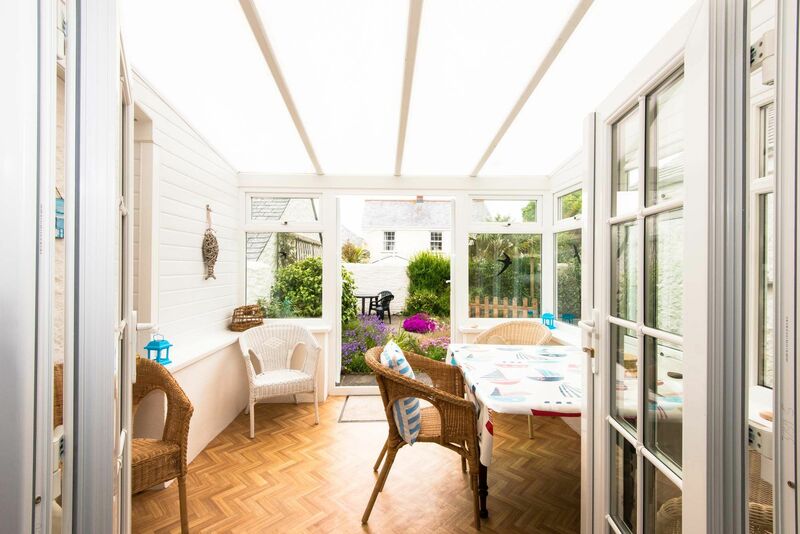 Exterior: Charming enclosed rear garden with external furniture. Heating is via night storage heating and the gas fire. The kitchen has a range or equipment. 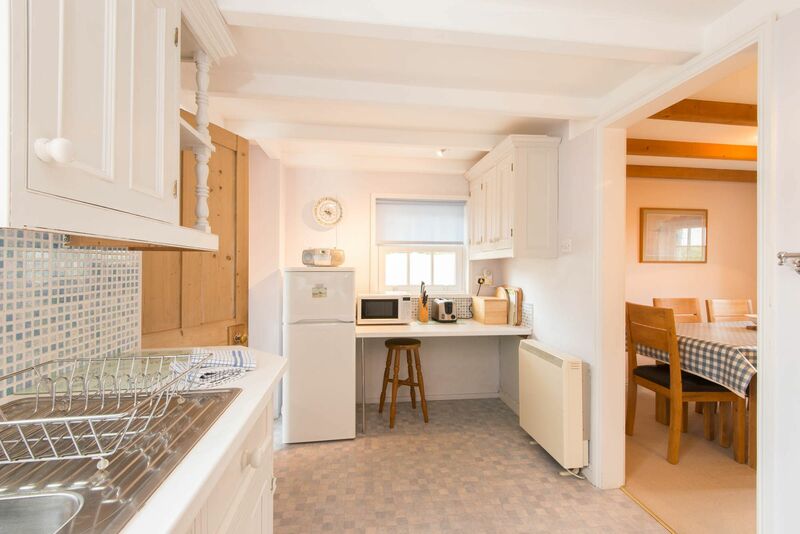 There is an electric oven & hob, microwave, kettle, toaster, fridge / freezer, dishwasher, washing machine and tumble drier. The lounge area has a flat screen digital TV & DVD player, with a radio and CD. WiFi is available at the property. There is an iron and ironing board. 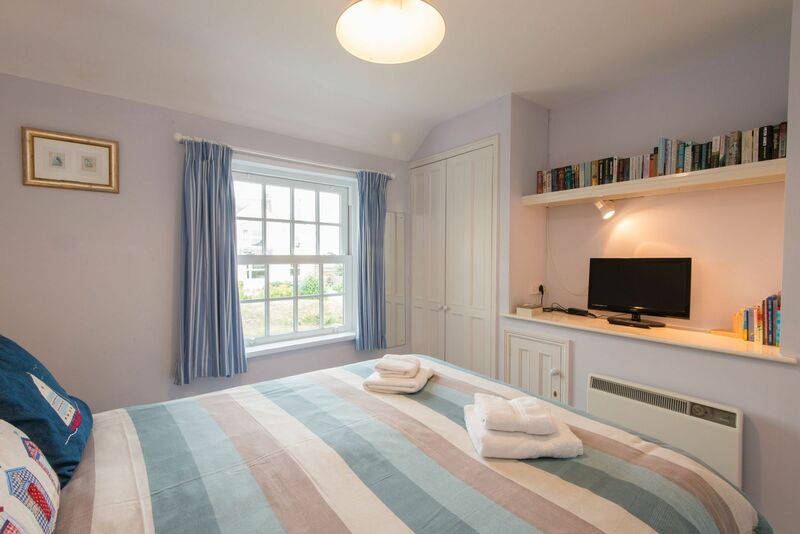 Electricity, heating, bed linen and towels are all included, but you will need to provide your own beach towels. There is off road parking facilities for one vehicle. 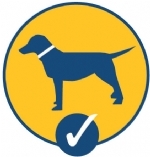 Up to 2 well behaved dogs are permitted at the small additional charge of £30 per dog per week, although guests are reminded about the specific conditions regarding dogs. Regrettably no smoking is allowed. There is a cot and high chair available. The Roseland Peninsula is an Area of Outstanding Natural Beauty and forms one of the finest sections of Cornwall's South Coast. From Mevagissey to St Mawes and bordered by the Fal Estuary to the west, the Roseland Peninsula has been drawing visitors for years with its splendid coastline, unique gardens, historic villages and superb sailing waters. With The Lost Gardens of Heligan and The Eden Project in one direction and Falmouth and the National Maritime Museum in the other, the Roseland is brimming with places to visit and things to do. St Mawes Castle, built by Henry VIII in the 16th century sits on Castle Point at the mouth of the River Fal. At the top of St Mawes, Lamorran Gardens house a wonderful collection of tropical plants. St Just-in-Roseland has arguably the most photographed church in Cornwall. The 13th century church sits quietly tucked away on the edge of the creek. The Veryan Roundhouses are a must see, on the way to Nare Head, where you will find the most spectacular views of Gerrans Bay. The little village of Portloe nestles in lovely valley and is one of Cornwall's quintessential spots. 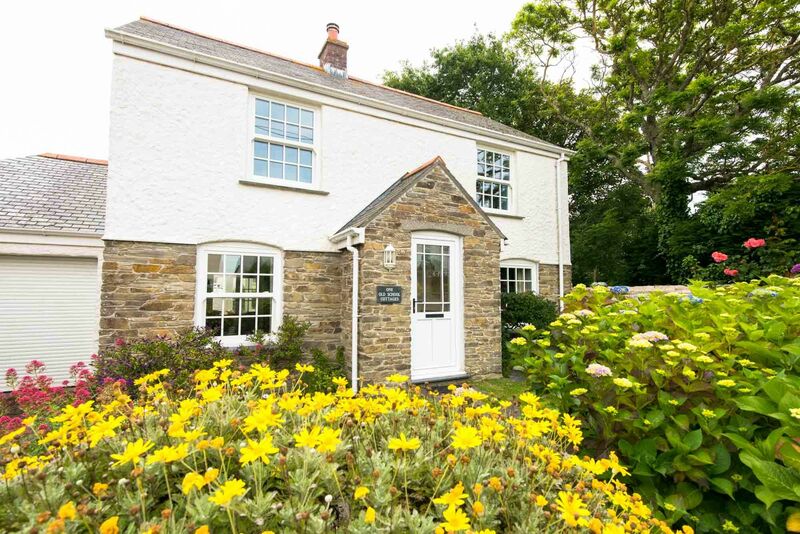 The Roseland Inn at Philleigh is a 16th century pub just waiting for you to visit.